Many cultivated plants can trace their 'roots' to common roadside wildflowers and gardeners often assume that the wild or native form is simply an escapee from someone's garden. Wildflowers are beloved little treasures that have inspired poets, artists and storytellers from around the world and learning to recognize them and preserving their declining habitat is something all gardeners should aspire to. Spring is on the way in west Kentucky. The grass is turning green, daffodils and crocus are blooming and buds are swelling on the trees. Spring also means 'spring beauties'. 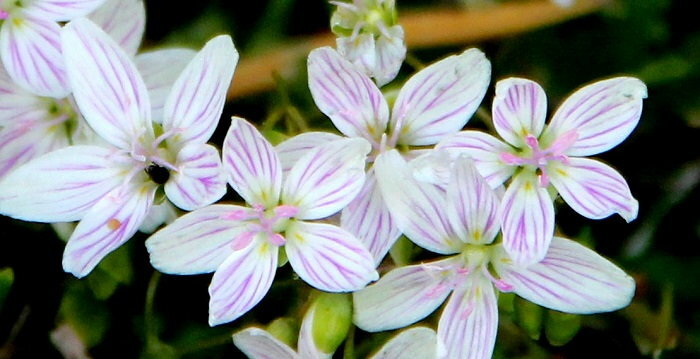 This sweet little wildflower is aptly named. It certainly is a spring beauty. The shimmery, pale pink blossoms open on sunny, early spring mornings and where large colonies have formed, they carpet the ground with blossoms that sparkle in the sunlight. There are several colonies near my home and it is always one of the first signs that the seasons are changing. They bloom about the same time as the spring frogs wake up and serenade us with their courting opus and although they are only here for a week or two, they are a welcome sight. Claytonia virginica is native to eastern North America from northern Canada to the Gulf Coast and should be an easy plant to grow. They are found along the edges of woods and in rich, sunny meadows where they carpet the ground in great numbers in the right conditions. 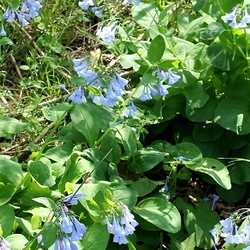 Spring Beauties are classified as ephemerals, which mean that after they have bloomed, the plant goes dormant and disappears until it re-emerges again in late winter and early spring. 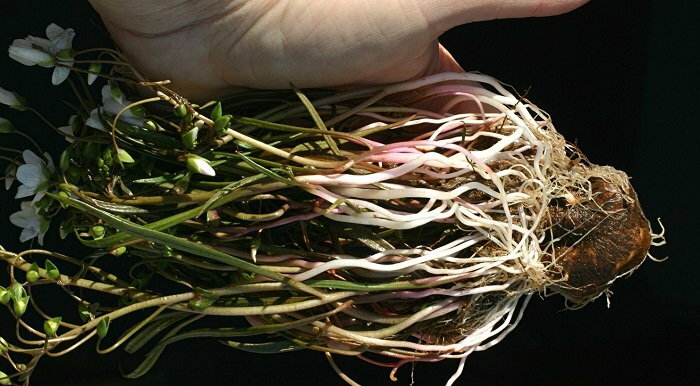 However, the plant is so small, that it doesn't tend to leave a gap in your garden in its dormant state. Many gardeners treat it like they would spring-blooming crocus, as it has a similar bloom time and habits. 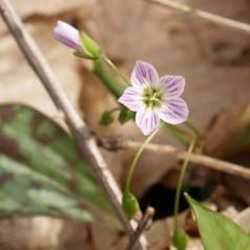 Claytonia virginica was named for John Clayton (1694-1773) who was a Colonial plant collector and farmer. He sent many samples of New World plants back to Europe and Linnaeus honored him by naming the genus after him. This plant was also well-known by Native Americans and they included it in their herbal pharmacy. They used the powdered roots to treat convulsions and as a birth control method, but there's been no medical evidence that it has any effect for either. The only documented use that still continues today is that the small, fleshy tuber is edible and was used as a food source. They are small and it takes a large number to amount to much of a meal, but wild food enthusiasts do love to add them to their foraging lists. They taste a bit like potatoes when cooked and similar to a radish if eaten raw. The leaves and flowers are also edible and can be used as a salad addition, or cooked and used as a potherb. The plant does contain Vitamins A and C, so could be considered a source of helpful nutrition for foragers. One of the common names Claytonia virginica is known by is ‘fairy spud' because of its resemblance to a potato in appearance and taste, although some enthusiasts say that they taste sweeter than a potato. Along with humans, deer, turkey, rabbits and ground squirrels also relish the taste, so if Bambi considers your garden his personal buffet, plan accordingly. The Chippewa also have a legend about the Spirit of Winter meeting the Spirit of Spring and as the Spirit of Winter fades away, the Spirit of Spring brings sunshine and the mushquash (their word for the spring beauty) to the land as he smiles upon it. Propagation is either by bulb offsets, or by seed and there are a few wildflower nurseries that offer it if you want to add some to your rock garden or perennial beds. Some gardeners (like myself) even let them naturalize in their lawns, as they would do in their native habitat. 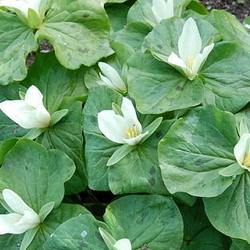 Plant in well-drained, rich soil and try not to disturb your spring beauties after that, to encourage them to multiply. They like sun to partial shade and the pretty little blossoms open on sunny days, while remaining closed on cloudy ones. Often, they will open and close several times in one day if the cloud cover is broken. They are a short, but spreading plant often growing no more than six inches tall, so they fit in nicely with other small spring lovelies such as houstonia and voilas. It may be tempting to lift some from a fencerow or sunny meadow for your own garden, but we discourage this practice. Stripping our native wildflowers from their habitats is against good conservation practices and should only be done in the event that construction threatens the plants. Even then, you should ask permission from the landowner. Only harvest plants with permission and where there is a large, vibrant colony. Remember to only take a few from around the edges and be aware that it may take several years for the spring beauties to settle in and bloom for you. When you purchase wildflowers, only do so from a reputable nursery that propagates their own. We are all responsible for our wild heritage and should try to be good stewards of the land.